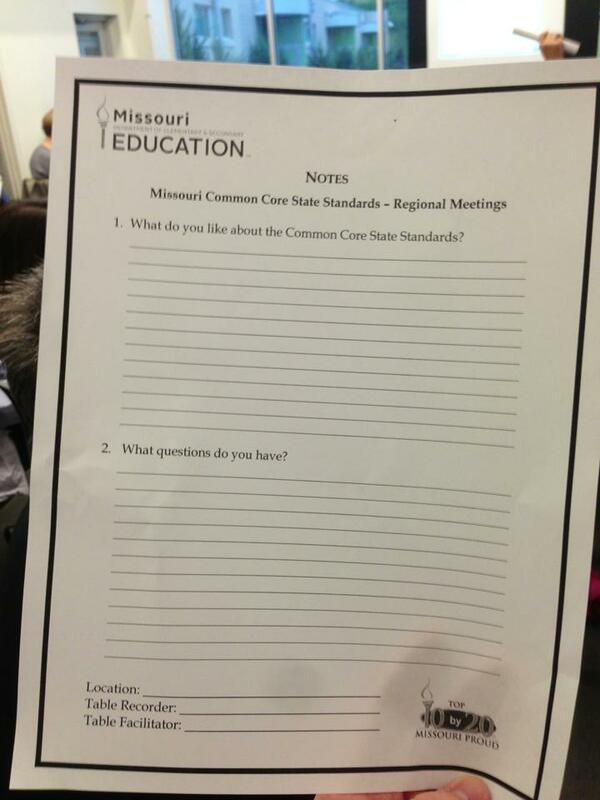 After attending our local Common Core ‘presentation’ by Missouri’s DESE, I’ve only time for a brief pre-post post. This picture (H/T Adam Bohn) of the only informational hand out that the DESE (Department of Elementary and Secondary Education) people brought to the meeting tonight, should tip you off to how the evening went. “Location:___, Table Recorder:___, Table Facilitator:______”. They never got that far, as their ‘Nudge’ bombed, big time. Bringing a knife to a gunfight would have been a step up from bringing a Thank You/”How do you like me now?” questionnaire to a Common Core Curriculum ‘presentation’ for angry parents armed with burning questions and an expectation of obtaining real answers. They oughta pay closer attention to the Missouri State Motto (maybe it’s not in their tests?). 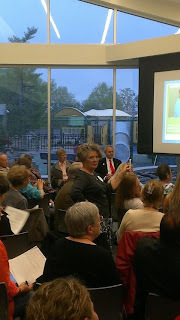 The presenter, a former school superintendent, Maureen Clancy May, gamely attempted to deliver a lengthy PowerPoint puff presentation, complete with video commentary from DESE leader, Chris Nicastro… to an audience who quickly realized, and politely (at first), let her know that her information was neither new, informational or in any way adequate to their expectations of useful information, discussion and debate. I felt sorry for her, briefly, but… seriously – very briefly. While I understand and sympathize with the expectation of being given a polite hearing, once it is clear that your audience finds that the information you are presenting is neither new nor adequate, and yet you still attempt to press on and over your audience with more of the same, you’ve passed well beyond the realm of the sympathetic and charged directly onto the grounds of the disrespectful. I don’t doubt his surprise. Much as we’d like to attribute nefarious conspiracies, the truth of the matter is probably closer to being that these standards are the results of smart people who think that what they think is best, should be simply accepted by the little people, to help improve their lives and serve the greater good. One good thing did come from it though, it provided corroboration for the fifth and last post in my look at the flip side of “Common Core Curriculum Standards: What to do about the parents?“, which will be coming Monday. Ok, it’s late and I’m beginning to sleep type, so for the moment I’ll just leave you with Brian Bollmann’s post whch lists a number of the questions that were also not answered in the DESE presentation given in Cape Girardeau, MO. There are questions there, some of which were asked at our gathering as well, which I strongly suggest that every parent and citizen read, ponder, and ask of their friends, neighbors, relatives, co-workers and representatives. If Govt is irresponsible with our money, because it’s not theirs, just imagine how irresponsible they are with our human capital (aka: our children), that is also not theirs. Sponsor: Rep. Bahr, Kurt (102), Co-Sponsor:Jones, Timothy (110) … et al. 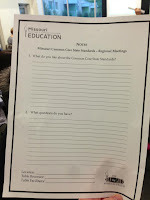 “SCS/SB 210″ – This act requires the Department of Elementary and Secondary Education to conduct at least one public hearing in each Missouri congressional district prior to the full implementation of the Common Core State Standards. The Department must notify school districts and parents of public school students of the hearings at least two weeks in advance. They’re not enough – action rarely is – but they’re a start. If you want to bring about real change, begin questioning Common Core to everyone you know. Second point, it was interesting the differing expectations for the evening, from people of the Lindbergh School District, and the DESE representatives. When I asked Lindbergh people if they were surprised by our reaction to the ‘presentation’, and none of them were, there was a distinct “I can’t speak my mind at the moment, but NoooOOOooo I’m not surprised – LOL!” smirk on several of their faces. Yet the DESE were completely shocked. My bet is that they are far to used to merely delivering the fruits of their thoughts to people, anything approaching Dialog, being completely foreign to them. Also, while the DESE gent I spoke with, Doug, who said he was surprised by their reception because for the very first time business, govt and the educational bureaucracy were in agreement on a plan, he seemed completely unaware that that was far from the case. When I pointed out to him that the one slide of the presentation that showed multiple descending lines of student performance on a graph, were lines that have always been descending, and that CCSS would continue with more of the same, he was quick to disagree… but he had no basis for that disagreement. He seemed to know nothing of several earlier moments of the sort of agreement he was so impressed by, and gave no indication of knowing that in fact modern (post Civil War) American Education began with such ominous instances of agreement, and has been pushed forward by multiple periods of such agreement. Of the recent fame of Finland’s success in education, he knew only of “In Finland, teachers are held in high regard… not so much here…” and knew nothing of (though he was quick to deny it) the autonomy Finland gives their teachers to choose their curriculum, lesson plans, and write their own tests. In short, he was another smart guy, with no base of information from which to guide his intelligence, and when mixed in with the power to affect other people’s lives, that is a recipe for disaster. The report of these meetings remind me of the attitude which McCaskill displayed at a town hall meeting back in 2009 or 2010. She was surprised and expressed offense at the passionate questioning by the citizens attending the meeting. It was clear she expected to rule over the town hall and the attendees to accept her explanations without serious questions. The same attitude seems to be prevalent in DESE as well. The “elite” know better than the citizenry what is good for them and their children, irregardless of the evidence to the contrary. Time for a change in the agencies in the State of Missouri in Jeff City. At the least, a change in how the agencies do the business of the citizens is needed. Anyone as stupid as “Doug”, who bases his opinions on nothing, or Maureen May need to be relieved of their positions along with all the “yes” persons in their retinue. Write, phone, email your Senators, State Reps, etc. to block the implementation of the “Common Core” standards, and have them get rid of the offensive staff who can’t seem to understand they work for the people of the State of Missouri. It’s time to clean house, Missouri. Hear , Hear ! Show – Me CHANGE !!!! Dissolve Electoral College Vote! Reclaim Human Jurisdiction- discover Maritime Admiralty Law (Fraud) ! Defund Fed’s! Shut down Federal Reserve! Hold these people accountable.. A new Supreme Court is the perfect place to start, all new seats in EVERY Branch, All The way to City and County positions in All States !! Show – Me Courage !!!!! Investigations all around!!!! Starting with the IRS and Senate !!!!!!!!!!!!!!!!! !